Big Top got a letter from land-use endorsing the idea of the ordinance change. They say their lease ends Jan 2019. The move to perkins is planned as a 2-3 year temporary home. Will have new location somewhere onsite in new development. The roof structure is basically complete, there are 2 or 3 crossbeams left to be installed and that's it. The roof its self isn't far behind. There are 6 more section of white horizontal tubular steel that make up the wave patter left to be installed. It looks like almost of the big heavy equipment has been removed from the seating bowl at this point. There still is gap to the north of the pressbox where larger equipment can go in and out but I doubt that remains much longer. The vertical ribs that are underneath the PTFE facade appear to be ratchet straps more or less, something I found to be surprising. The lighting on the horizontal elements that will illuminate the facade are being installed, I'm super excited to see it lit up for the first time. I'm guessing most people saw this in the news but Allianz is going to host the Conacaf Gold Cup, the rumor is that the stadium will host the opening round of the event with the US playing here which is AWESOME! There was a recent story that the price tag has risen to $250M. Up from the $150-200 estimate. I remember when it was first proposed as $100 even. Ha! Yeah the original estimates would have been for a pretty bare bones stadium, which never jived with the kind of stadium they were talking about building. I always figured they planned to spend much more but didn't want to overcommit at the beginning, especially since it all came together very fast and McGuire is still new to this whole sports ownership thing. 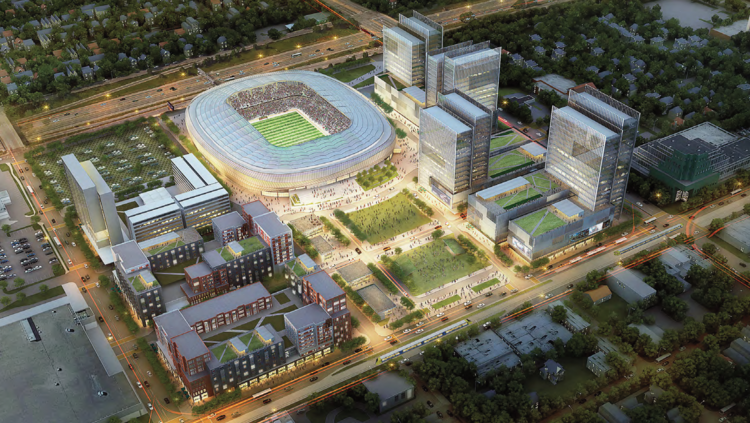 I've heard these renderings described as the "Disneyland plan" by real estate types. I think it will be a long time before we see anything close to this happen, unfortunately. Like the article says, housing will probably happen first and is the safest bet. Can developers really make sense of market rate/luxury in this location? Office can barely get built in downtown Minneapolis, so I don't see anything more than filler space going in here. Doubling down on the retail presence/history of the area, you would like to think a higher-density "lifestyle center" could work as a 2nd incarnation of Midway Shopping Center and absorb some of the lost retail space... Time will tell. The article mentioned something about a record to seven year waiting period. Does that mean it’ll be approximately 4 to 7 years before the first building is built? I've said from the beginning the stadium success or failure over the long term is going to be judged not by the how many people it draws but what is developed around it. What the site really needs is an anchor tenant that would bring a few thousand employees to the site Monday to Friday and that would jump start the entire development. Honestly it would be perfect for site for a back office for a major corporation that has it's HQ in either downtown, like say Target (but no they have they have that stupid campus next to a cornfield in Brooklyn Park that contributes nothing meaningful to anything). Unless Mortenson can somehow land that tenant I would guess we end up with a few standard issues 5 over 1 apartment building, that may or may not work, which is an upgrade for sure but falls short of what could have been. Photo of the fabric wrap of the stadium. I think that central piece is close to the maximum stretch, and how it will ultimately look. I went by from the north (i.e. on the train) for the first time today, and the north side is really striking with the roof line dipping down. It really does look like a spaceship, albeit a spaceship with a McDonalds out front. It doesn't mention Walgreens like the meeting notice does, and I do wonder how they could fit both that and the bank into this space. Either way, construction of 175 market rate apartments in this neighborhood is a big deal - it would have been unimaginable a couple of years ago!